The refugee crisis opened my eyes to the world. However, my creative disruptor was awakened within me through my own internal experience of changing my life after suffering with PTSD for 37 years and being on incredibly high doses of medication and leading a pretty selfish and destructive lifestyle. When I fixed myself so to speak, I became more aware of what was happening around me and I intuitively knew I could create change in my external world, by creating the change within myself I automatically had a desire to do more in my world- it became effortless and was simply part of who I had become. I have set up a humanitarian aid not for profit organisation so that we can help in some way towards finding solutions and sending humanitarian aid to where it is needed. I am working with individuals and other refugee welcome/aid groups across the South West to collect and send aid. 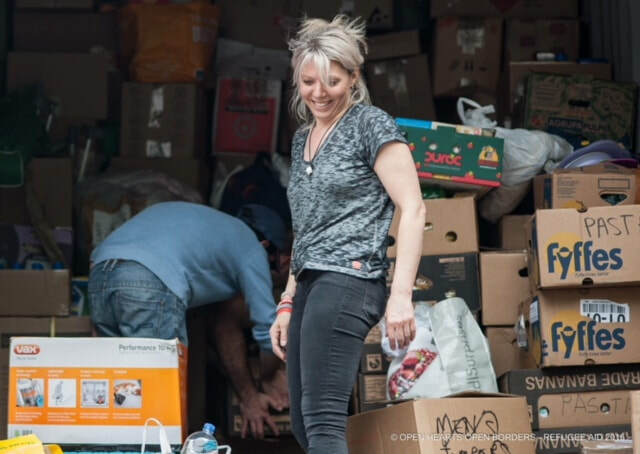 We are all volunteers and we are focused on sending aid on a regular basis out to Greece and France - we have donation points dotted across Devon and Cornwall and we have various appeals which run for a few months at a time. We support 4 very specific projects in Europe and collect on a regular basis for them, we only collect items which they need. We have grown to be an amazing collective working together and we span across many miles across the South West and I incredibly humbled by the amount of people out there who are simply kind and giving, they inspire me. I am also working with Safe Passage to campaign for the safe passage of vulnerable child refugees to be brought to the UK. I tap into my own energy and power and look to the universal energy that surrounds us to recharge myself, I stay focused, I stay positive and I choose very wisely who I work with and what I take on. I look to solutions rather than staring at the problem, I stay emotionally detached from the negativity, I only take on what I know I have the time to do and I choose my battles very carefully so to speak! I never go into fighting or resisting, (what you resist persists!!) I go in with love and peace in my heart, I am assertive when I have to be, but my strength and motivation comes from the giving and the grounded attitude I take towards life. Life happens through us not to us… when you live by this you can achieve anything you want. I understand that big change is small steps – it’s the ripple effect of the pebble in the water, put in the good and watch it spread - and each small change is a piece of the bigger jigsaw puzzle of life. We all have a role in this world and we all are here to create and to bring goodness into it - some are just not quite aware of it yet, so if by doing what I do helps with that then great! I focus on the good in the world, I know there is not bad stuff happening, but why focus on that, when we focus on the good it grows and isn't that what we want more of? Make a firm decision to be part of the change… take one small step towards the change and doors will open for you, don’t expect the quantum, leap - focus on the small incremental steps you can take and this will have an enormous effect. Everything you want is on the other side of fear, in order to get to where we need to be we have to step out of our comfort zone and take on what we can. When we make the decision what we need just flows to us! Believe in possibility not impossibility!